PHP is a popular programming language. It is often integrated with web servers but works just as well when creating standalone applications. Download and manually install the PHP package, if necessary. We have installed PHP in C:\PHP and we'll reference that location throughout this tutorial. Next, let's ensure that your PHP script can run normally from the command line. 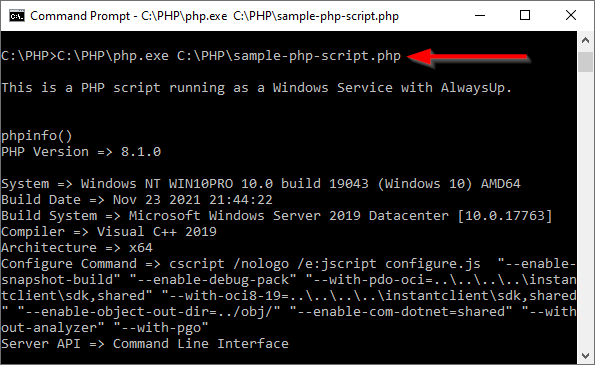 In the window that appears, type the full path to the PHP executable (php.exe) followed by the full path to the script you wish to run as a windows service. Be sure to quote each component containing at least one space! Hit the Enter key to execute the command line. If your script doesn't work as expected please resolve the issues now. For example, if you get the MSVCR110.dll is missing error, please install the Visual C++ Redistributable package for Visual Studio 2012. Note that if your script doesn't work here then it won't work with AlwaysUp! In the Application field, enter the full path to the PHP executable (php.exe). 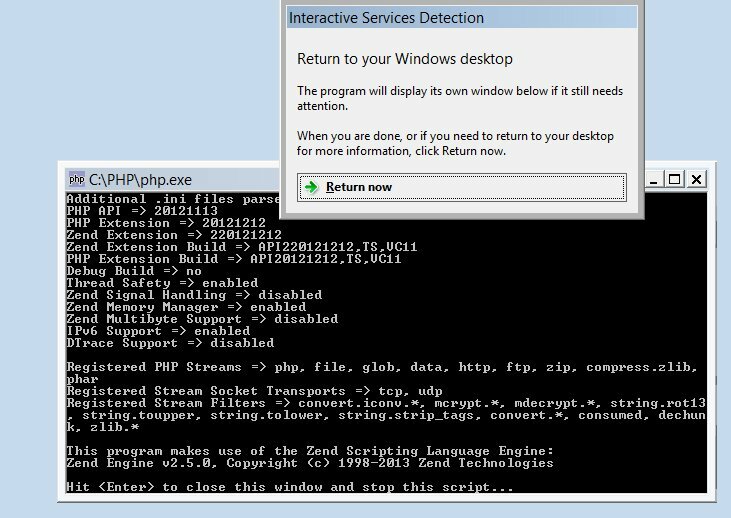 Again, this is C:\PHP\php.exe for our installation. In the Arguments field, enter the full path to your PHP script. We want to run our sample script, C:\PHP\sample-php-script.php. In the Name field, enter the name that you will call this application in AlwaysUp. We have used My PHP Script but you can specify virtually anything you like. 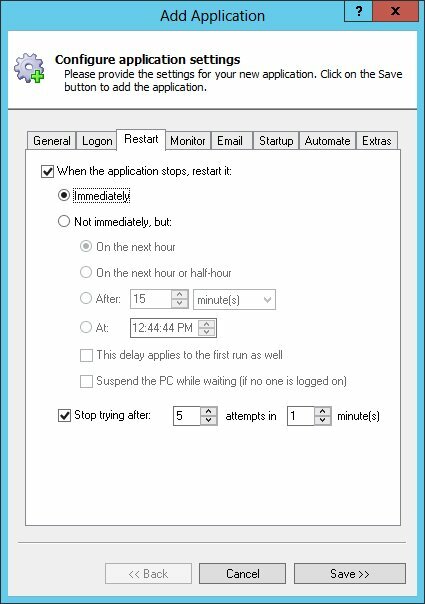 If you only want your script to run periodically (that is, not 24x7), click over to the Restart tab and choose when to run. For example, if you wish to kick off the script at 6 AM every day, check the Not immediately and At boxes and enter that time in the corresponding field. However we'll stick with the default of restarting immediately to keep our script running continuously. Click the Save >> button. In a couple of seconds, an application called My PHP Script will show up in the AlwaysUp window. It is not yet running though. That's it! Next time your computer boots, your PHP service be launched immediately, before anyone logs on. We encourage you to explore the many other AlwaysUp settings that may be appropriate for your environment. 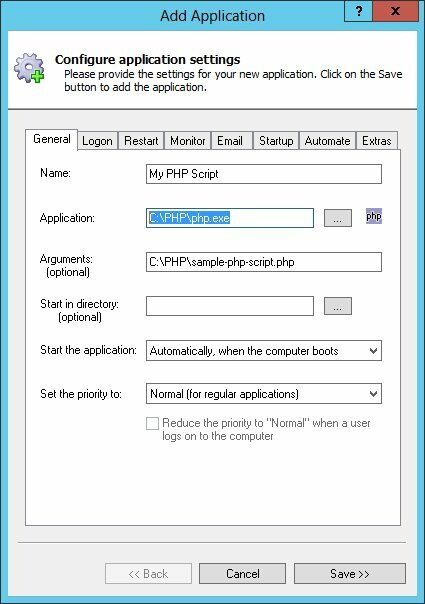 PHP script not working properly as a Windows Service? Some PHP scripts need to be run in a user account to have access to their settings and resources. 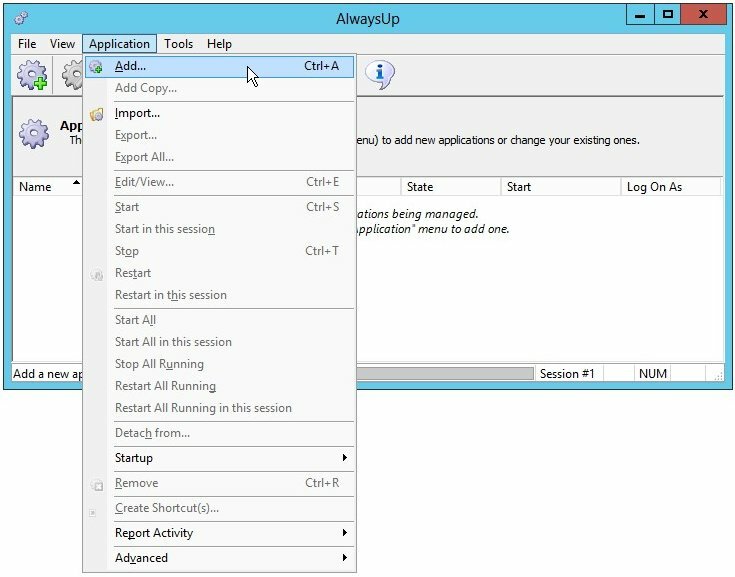 In that situation, edit your application in AlwaysUp, switch to the LogOn tab and enter the user name and password of the account where you can run your PHP script normally (the one you were logged in to for step 3).